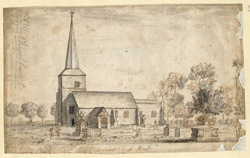 View of St Nicholas's Church, the parish church of Chislehurst, at this time in Kent. It is a 15th century church built mainly of rough flint. The church tower lies on the west side of the north aisle. It has a tall shingled spire which is a local landmark. During the medieval period the local manorial family were the powerful Walsinghams, and their involvement ensured there were some good quality tomb monuments here.